We’ve reviewed the suggestions, and came up with a short list of five battles* which stand out as the most important to us (with short descriptions from Wikipedia) – what do you think? 1664, The English Seize Manhattan Island: In autumn 1664, four English warships with several hundred soldiers onboard arrived in New Amsterdam’s harbor and demanded the Dutch surrender. Although Peter Stuyvesant at least outwardly prepared to fight, prominent city residents persuaded him to stand down, and on September 8 he signed the colony over without any blood being shed in one of the skirmishes of the larger Second Anglo–Dutch War. The English renamed the fort Fort James, in honour of James II of England, and New Amsterdam was renamed New York in recognition of James’s title as Duke of York. 1776, Battle of Valcour Island: The naval Battle of Valcour Island, also known as the Battle of Valcour Bay, took place on October 11, 1776, on Lake Champlain. The main action took place in Valcour Bay, a narrow strait between the New York mainland and Valcour Island. The battle is generally regarded as one of the first naval battles of the American Revolutionary War, and one of the first fought by the United States Navy. Most of the ships in the American fleet under the command of Benedict Arnold were captured or destroyed by a British force under the overall direction of General Guy Carleton. However, the American defense of Lake Champlain stalled British plans to reach the upper Hudson River valley. 1777, Battle of Oriskany: The Battle of Oriskany on August 6, 1777 was one of the bloodiest battles in the North American theater of the American Revolutionary War and a significant engagement of the Saratoga campaign. An American party trying to relieve the siege of Fort Stanwix was ambushed by a party of Loyalists and allies of several American Indian tribes, primarily Iroquois. This was one of the few battles in the war in which almost all of the participants were American; Patriots and allied Oneida fought against Loyalists and allied Indians in the absence of British regular soldiers. The battle marked the beginning of a civil war among the Iroquois. 1777, Battle of Saratoga: More corectly known as The Battles of Saratoga (September 19 and October 7, 1777) marked the climax of the Saratoga campaign, giving a decisive victory to the Americans over the British in the American Revolutionary War. British General John Burgoyne led a large invasion army southward from Canada in the Champlain Valley, hoping to meet a similar British force marching northward from New York City and another British force marching eastward from Lake Ontario; the southern and western forces never arrived, and Burgoyne was surrounded by American forces in upstate New York. Trapped by superior American forces with no relief, he retreated to Saratoga (now Schuylerville) and surrendered his entire army there on October 17. His surrender is considered the turning point of the American Revolution because it won the foreign assistance needed for a final victory at Yorktown. 1839-45, The Anti-Rent War: The Anti-Rent War (also known as the Helderberg War) was a tenants’ revolt in upstate New York in the period 1839–1845. The Anti-Renters declared their independence from the manor system run by patroons, resisting tax collectors and successfully demanding land reform. As a result, The New York Constitution of 1846 added provisions for tenants’ rights, abolishing feudal tenures and outlawing leases lasting longer than twelve years. The remaining manors dissolved quickly as the patroons sold off the lands. * Obviously, some of these are not individual battles, per se, but you get the point. Notably missing is a battle the meets the overall criteria during the French & Indian War, although the outcome of the war meant that Northern New York speaks English instead of French today. 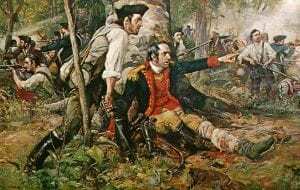 Illustration: “Herkimer at the Battle of Oriskany” Although wounded, General Nicholas Herkimer rallies the Tryon County militia at the Battle of Oriskany on August 6, 1777. Painting c. 1901, now at the Utica Public Library. Great article, John! Before today, I never heard of the Anti-Rent War, of 1839-1845. It’s something I plan to look up. You hit all the other historically significant battles, as well. I don’t know if the 1779 Battle of Newtown qualifies here, but I think it does … especially serving as the terminus of the Clinton-Sullivan Expedition. This was a terrific way to heat up the ranks. You did a very good job here. The Battle of Saratoga hands down, This was the turning point of the American Revolution. In August of 1777 the American cause seemed headed for certain defeat. General Horatio Gates, a passed over British supply officer was placed in charge of the dispirited American forces by the Continental Congress. Two months later the 12,000 man British, Canadian and Indian troops surrendered. For more than 200 years General Gates lay in obscurity in an unmarked grave in Trinity Churchyard in Manhattan until in 2012 New York State DAR regent Denise Van burren (soon to be National general of the DAR) rescued him by spearheading an effort to place marker to him. The importance of efforts like hers and that of the History Blog to educate New Yorkers about their real history cannot be underestimated. 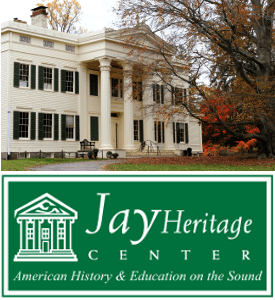 I agree with you about the Battle of Saratoga… just not about General H. Gates. Gates was a lousy field commander, although being an excellent quartermaster. In fact Gates was the worst general in the entire Continental Army. Saratoga’s victory was produced by actions taken by Generals Daniel Morgan and Benedict Arnold. In fact, Gen. Gates had only a marginal role at Saratoga. His only major engagement of the entire Revolution came at Camden, S. Carolina, where he was totally out-manuavered by the redcoats, and subsequently devastated. He left his entire army in the field, to surrender by-themselves, while he selfishly galloped North to save his own hide. This was the most humiliating loss to the enemy of the whole of the War. Unlike Washington, who always kept his army intact during key losses to the enemy, Gates was a coward and a glory-monger. His real talent manifested in pushing a pencil across a page to determine good supply routes for the Continentals, but not as a leader of men. “Granny,” should have just stuck to staying in his rocking chair, as opposed to pestering the Continental Congress for a field command he never truly deserved in the first place. Gates made every mistake at Camden that a General could make, without listening to his subordinates. He was court-martialed by the C. Congress, as a result. The man who sought to undermine Washington’s career ended his in disgrace. Washington and Morgan’s victories in the South are what gave Americans their independence from the British. This is why Gates was to die in a somewhat obscure fashion, while not so much for his fellow Patriots. Hamilton and many others all had a low opinion of Gates, as a military man. History and the facts have not proven them wrong. One of the greatest land owning families, the Clarkes, survived the anti-rent war. Their 117,000 acres were located in the Mohawk, Schoharie and Cherry valleys. A second but different anti-rent war took place later in the 19th century. The anti-renters called themselves Modocs rather than Calico Indians and burned farms and barns in Montgomery and Otsego counties. George Hyde Clark lost $75,000 worth of property in Montgomery County alone due to arson from 1873-75. Edith Mead Fox’s book, Land Speculation in the Mohawk Country, details the Clark’s acquisition of land. Harvest of Dissent by Thomas Summerhill discusses in detail the last anti-rent war in New York state, the grange movement and also discusses the failures of the first anti-rent wars. The Clark’s estate was not broken up until Clark went bankrupt in 1886. Good point, Mr. Hughes. We tend to forget the Battle of Long Island because it’s a Battle we lost. I would also like to mention Ali-Frazier 1, but I think that one doesn’t fit our discussion here. The Battle of Saratoga was important (and most recognizable) for the country, but for the pure impact on the majority of the state – Battle of Oriskany hands down. The near rout broke the militia for years to come, stirred up the Natives, and opened the door for the loyalist raids in the future. The battle sparked the War in Upstate New York, and many future battles would never have happened without it. And as a result the frontier was basically rolled back to Schenectady. It also changed upstate, with many established communities disappearing as they once were and provided the opeing to push into Western NY after the war. Oriskany was certainly the most important battle of the Revolutionary War. Without it, no disruption of the British 3-point plan. No disruption of the 3-point plan, no victory at Saratoga. No victory at Saratoga, no entrance of the French on the side of the colonists. No disruption of the British 3-point plan and no French involvement would have spelled defeat of the colonists. The plan was to destroy the “bread basket” of the revolution (Mohawk Valley) on their way to Saratoga to help General Burgoyne and General Howe who were to receive General St. Ledger’s troops in combining to beat the colonists. Like a three legged stool, one leg missing makes the stool useless. Oriskany, which was actually an American defeat in which the the New York militia was ambushed by the British and Indians, was important as a subsidary battle to Saratoga which prevented the British forces under General St. Leger from attacking General Gates troops at Bemis Heights from the West. It was the gallant failure of the Continental garrison at Fort Stanwix to surrender that led ot its sometimes being called a victory to day, but I hardly believe it can be ranked as one of the most important battles of the war. Saratoga by contrast was fairly clearly the most important baattle of the Revolutionary War. The idea that the battle was really won by subordinates of General Gates and not Gates himself has long been a myth promoted by certain Washington biographers seeking to obscure the fact that it was Gates (who is buried in New York City) and not Washington who was in charge at this most critical battle while Washington after his loss at the battle of Brandywine was hiding out in Pennsylvania. In fact itw Gates brilliant strategy of rallying the New England militias and forcing the British into an untenable supply position that led to the unlikely and stunning American victory in which 10,000 British troops surrendered. It is true that later in the war Gates had a bad day at the Battle of Camden, but he was reinstated to his position after an inquiry at the end of the War. Gates subsequently had an illustrious political career as a Jeffersonian politician in New York City where in the elections of 1800 he successfully ran for the New York State assembly on the Deemocratic ticket thus defeating Alexander Hamilton’s Federalist party and leading to the elction of Thomas Jefferson over John Adams. celebrations which have now been held annually in mid October (around the anniversary of the British surrender at Saratoga) in Trinity Churchyard in Lower Manhattan for the past five years by the Lower Manhattan Historical Association. At such celebrations, representatives of the Sons of the Revolution of the State of New York, the Sons of the American Revolution, and the New York State Daughters of the Revolution lay a wreath on his recently remarked grave. General Gates was not an important factor at the Battle of Saratoga. The facts are clear about this. 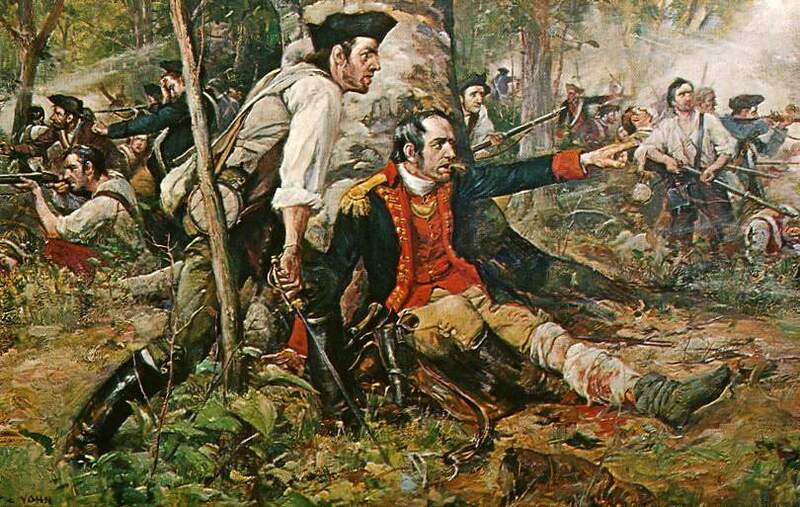 The Green Mountain Boys and other Patriot units led by Arnold, Allen and Morgan devised the winning strategy there. When you say things contrary to the facts, you lose credibility. Gates was a first rate logistics guy…and that’s it. Arnold and Morgan did. Washington was a superior general than was Gates. 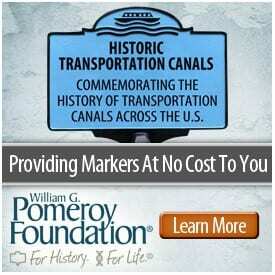 Trenton, Princeton only suggest this…but it was Washington’s route of the British at Monmouth, NJ that confirmed this. He took on the vanguard of the entire British Army and fought them to a humiliating stalemate. The battle took place on one of the hottest days of the year…and Washington rallied his men from a premature retreat initiated by the nefarious Gen. Charles Lee…and he was successful. If Gates was in charge at Monmouth, the Patriots would have lost the battle. Gates was not a natural leader and Washington was. Washington demonstrated at Monmouth that the blue coats were the equals to the British on the field of battle. He also devised a top-tier spy network that badly nullified much of the War efforts against America, by Britain…the Culpers. Washington was not a quitting man and Gates was. The fact is there probably was no key victory that overshadowed others in New York State, or in any other state against England because any victory the Yankees won versus their British enemies was a “key” victory…since the odds were always stacked against them. The British had a professional army… which the Americans lacked. The Yanks also did not have England’s bankroll. All they had was inner strength and their prayers. France did help, but Washington was the General who knew not to surrender. He suffered side by side with his men at Valley Forge. Remember two of Washington’s worst defeats came at the Battles of Long Island and Brandywine Creek…but these were defeats that stemmed from American inexperience and not for lack of trying. Washington never abandoned his men when the going got tough, as did Gates. And Brandywine was a battle that the US initially was winning, before they accidentally got shelled by their novice artillery cores. No one ever trusted Gen. Gates after his debacle at Camden. His political career can hardly measure up to Washington’s. His military reputation is quite inflated and Gates’ conduct at Camden was inept and shameful. Morgan was not at the Battle of King’s Mountain. Mea culpa. The Brandywine-Germantown campaign, I meant to say.